The version should have been changed to 1.1.0 with the previous release, because the tabbed browsing was a great improvement for the user experience. The inter-repository browsing feature will introduce a sophisticated data analysis between different data sources. It is extremely helpfull in microservices architectures and is therefore another great improvement that increases the options of data browsing. More well known drivers to driver browser. Entity browsers should expand to the actual viewport size when maximized. Bugfix: NullPointerException when no primary key is available on table with clob or blob column. Bugfix: MS sqlserver – JDBCType -155 (DateTimeOffset) is not a valid Types value. The entity repositories will show an error marker if configuration values required to establish an entity session are missing. A driver browser is added to the entity repository configuration dialog to easily find your driver. For each entity repository session a new tab will be created. Thus you can browse different entity repositories in parallel. The entity browser’s content tables can now be adjusted to fit it’s content by just one click. Use the autofit button at the upper left corner. The entity browser window’s width can also be adjusted to fit the content by holding the CTRL key while pressing the autofit button. For a better orientation the entity selection outline does now paint a view area rectangle to make the position of the actual view visible. The entity browser’s status bar now shows the total number of entities in the repository. Maven repository based driver browser for well known group and artifact ids. Support for multiple entity browser sessions using tabs. 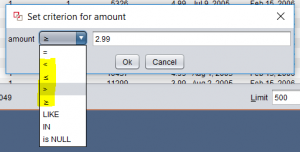 Auto adjust entity browser table columns to fit content. Count of all entities that match. Rectangle view for entity selection outline. Entity repositories can be copied by editing an existing repository and change it’s name. Datanect can download JDBC drivers automatically from any maven repository. Just use the special mvn:// protocol. E.g. 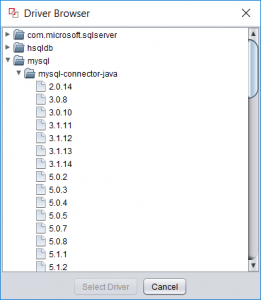 to use a MySQL driver you can set the driver URL to mvn:///mysql/mysql-connector-java/6.0.6. The format is mvn://[groupId]/[artifactId]/[version]. It uses your personal maven settings located in USER_HOME/.m2/settings.xml. Thus you can configure remote repositories, mirrors, proxy servers, etc. as usualy. Take a look at the Maven Settings Reference. Entity browsers can be tree layouted by their join dependencies using the tree layout button in the toolbar. Entity browsers can be flow layouted by their join dependencies using a flow layout button in the toolbar. The flow layout brings them in a sequential order. All open entity browsers can be refreshed at once using the refresh button in the toolbar. Entities that are selected can be exported via the context menu. 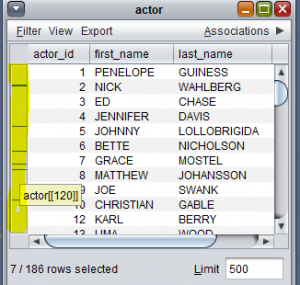 Datanect can export the entity’s metadata as an SQL-DDL script. Datanect supports export into Excel, XML, XML flat and SQL (insert script). 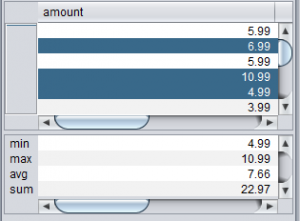 When using SQL export you can also specify the export SQL-dialect. Take a look at DBUnit’s xml and xml flat dataset format description for details on xml export. An aggregate view can be activated for each entity browser: View -> Aggregate View. The aggregate view shows the aggregation of the actual selection. The entity selection outline helps you to get a quick overview of how many entity are selected in an entity browser. When you put the mouse over the entity selection outline it shows you the id of the entity at that position. You can scroll to any entity by double-clicking onto the entity selection outline. The license view shows you detailed information about the license’s state now without the need to open the license details.